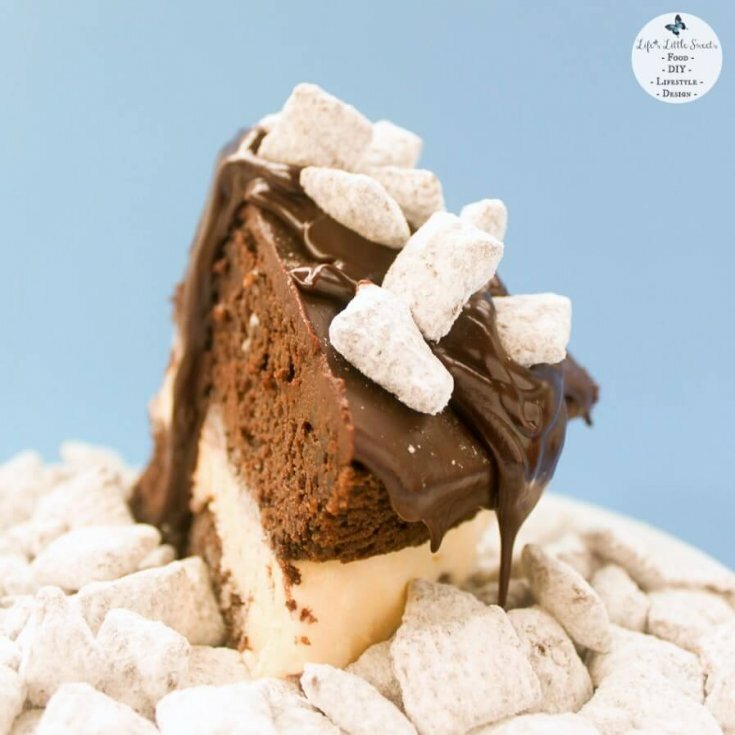 Above is a video from the Life’s Little Sweets YouTube channel of Muddy Buddy Brownie Ice Cream Cake, be sure to subscribe to the LLS YouTube Channel for future recipe videos and more! 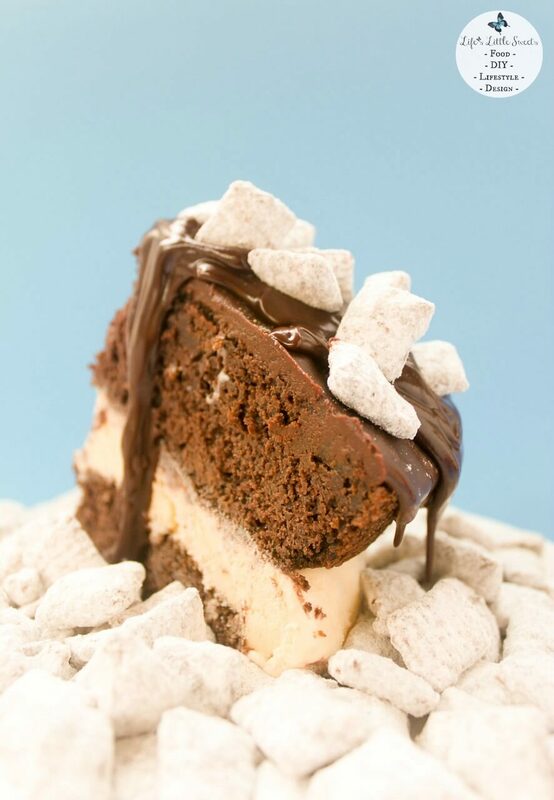 Muddy Buddy Brownie Ice Cream Cake is the stuff that dreams are made of, specifically, my dreams, and this is a delicious dream come true! Imagine this: Nutella Muddy Buddies top a layer of smooth, warm mocha ganache, with a layer of cold, vanilla ice cream between two layers of your favorite brownie – in a bed of more Nutella Buddies! I made this assembled ice cream cake for my husband’s birthday in October (2015). I remember I was in a time crunch but I wanted something unique and fitting. Since he loves cereal, ice cream and chocolate, I incorporated my Nutella Muddy Buddies recipe, brownies for the “cake” layers and vanilla ice cream to counter all that chocolate with mocha ganache to bring it all together. It was so good, with varying temperatures (warm ganache + cold ice cream), varying textures (crunchy Nutella Muddy Buddies + soft, fudgey brownie layers). It reminds me of a dreamy ice cream sundae – in cake form. 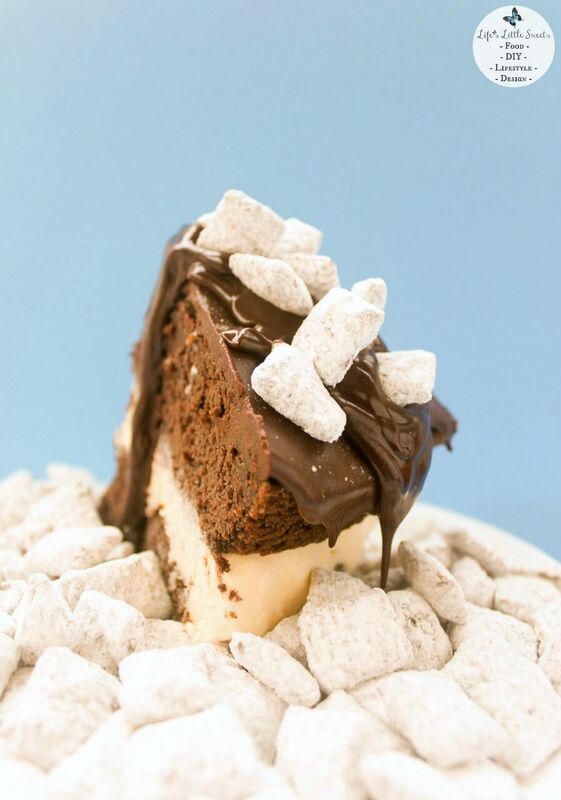 Muddy Buddy Brownie Ice Cream Cake is the stuff that dreams are made of, specifically, my dreams, and this is a delicious dream come true! Imagine this: Nutella Muddy Buddies top a layer of smooth, warm mocha ganache, with a layer of cold vanilla ice cream between two layers of your favorite brownie – in a bed of more Nutella Buddies! Prepare two 9 inch by 2 inch round pans with parchment paper and grease - this will help when removing the brownies from the pans, alternately, you can try using a spring form pan, although I have not personally tried this recipe with a spring form pan. Bake the 2 boxes of brownie mix in 9 inch round cake pans (1 box per pan) according to the brand's instructions. If it does not give a baking time for a round pan, go by the square pan given and check on the brownies before it's due out of the oven - remember you don't want to over bake brownies! Have the Nutella Muddy Buddies prepared ahead of time or prepare while the brownies are baking according to recipe. Prepare ganache according to recipe, set aside. When brownies are done (according to the brand you chose), allow brownies to cool completely before assembling the cake so the ice cream does not melt. After the brownies are cooled completely and the bottom brownie layer is removed from pan onto serving plate, have your ice cream ready and start scooping round balls of ice cream onto the top of the first layer, keeping them tight together. Once the first layer is covered, depending on how soft the ice cream is, you can try to spread the balls of ice cream together or you can just leave as is, you just want to make sure that the ice cream layer is flat for the 2nd layer of brownie to avoid the top layer breaking. Remember, if it does break, it will be covered with ganache and Nutella Muddy Buddies and will still taste amazing. Very carefully, place the 2nd brownie layer on top of the ice cream layer. At this point, if the ice cream is melting, you can refreeze it or keep going. Top cake with the ganache, it should be warm enough to be able to be spread or if you prefer for serving you can have it warm which is a nice contrast to the cold ice cream. You can have any extra ganache for serving. 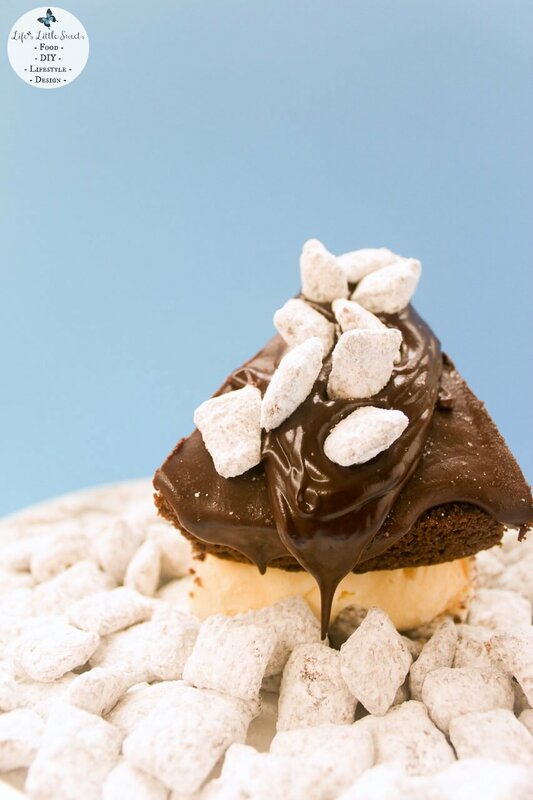 Top ice cream with the Nutella Muddy Buddies. There should be plenty left over for more snacking. You can place them all around the cake and for garnishing on top of each slice. DO YOU LOVE ICE CREAM CAKES? WHAT ICE CREAM CAKE MEMORIES DO YOU HAVE? WHAT’S YOUR FAVORITE BROWNIE RECIPE? LET ME KNOW IN THE COMMENTS BELOW! Oh, Sara this is just a killer ice cream cake! I love everything about it 🙂 Would love a slice right now! This is such a clever idea for a cake, looks delicious! Yes, I love Ghiradelli brownie mix, it’s SO good! Brownie mixes make life soooooo easy. And this cake , oh this cake. It rocks. I am so glad you think my cake rocks Bintu! What a fun idea for a cake!! And I looooove muddy buddies so this cake sounds perfect to me! Hi Liz, I love Muddy Buddies too, they are such a great snack! My goodness! This cake has got it all! I don’t think I could eat just one slice! Yes, this is definitely perfect for a sweet fix 🙂 Thank you for visiting! Thank you Marsha! Sending you a virtual slice! Wow, this cake looks amazing! You’ve combined many of my favorite foods into one cake:) I’ve always loved boxed brownie mix too! Thank you so much Kelley, it really means a lot to hear that! Thank you for visiting! I use Ghirardelli boxed brownie mix too. I put chopped walnuts in it and it tastes awesome. I think it’s the reason why I never bothered to learn to make brownies from scratch TBH. But I digress…this cake is THE BOMB. Your pictures, the way you describe it – it is a delicious dream come true. I know a lot of chocolate lovers whose birthdays are coming up who would love to have this as their birthday cake.